The Plant and Share botanical skincare range has been inspired by the plants and preparations that our ancestors have used for centuries. Organically grown herbal oil infusions form the basis of this carefully handcrafted skincare range. 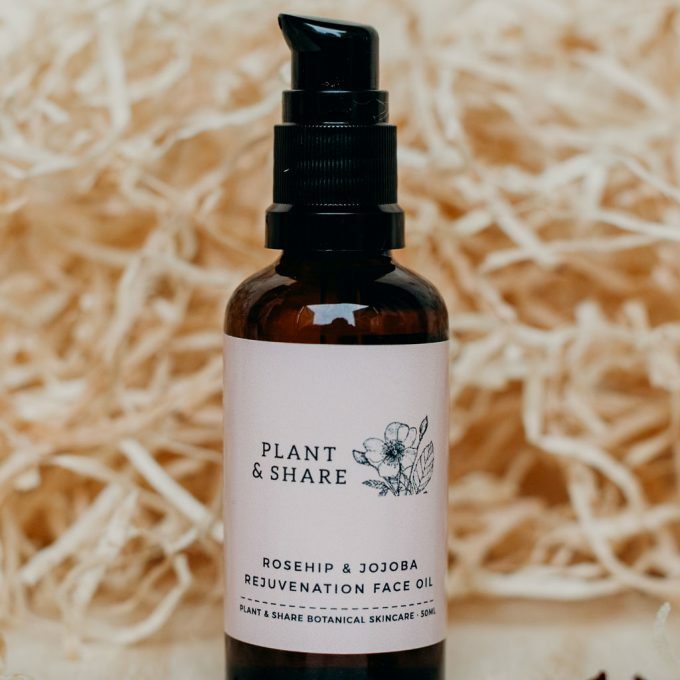 The range has grown alongside my five-year-old son, in the quest to find safe, simple and effective skincare, using organically grown and spray-free ingredients right here in Nelson, New Zealand. The range includes nourishing organic baby and pregnancy skincare, rosehip-based face care, herbal infused balms and salves and my much loved 100% natural deodorant. New to the range is the 95% organic botanical makeup, “5 free” nail varnish (not organic sorry to say). I also create limited edition palm oil-free soaps that are unique in that they use organic base oils; these are perfect special gifts. The Plant & Share PICK-N-MIX PACK allows you to create your own mix of three Plant & Share products. Comes with a FREE Cotton hand stamped bag. Choose from our extensive range of 8G Balms, 10ML Face Oils, 4.5G Lip Balms, Mini Flower Bottles. My studio, workshop and gardens are based on our four-acre property in Pigeon Valley, Nelson, New Zealand. Please contact me if you would like to bring a small group out to see my processes and products (ideal group numbers are 3-10). Thank you for supporting NZ made. I talked to a mum who used your balm, and her child slept through the night for the first time ever!! Thank you soo much for my order of baby calm balm and the little extra for me. I got a sample of your product from the Auckland baby show last year. I took it out a couple of months ago when my twin boys were restless one night and had decided that no one in the house was sleeping. Since we have started using it daily they are both sleeping so much better which in turn means I sleep better. I have used the Baby Calm Balm on Benjamin ever since he was an infant. Putting it on became a night time ritual early on - we'd put a little bit under his nose and on his temples. I am sure it assisted our little man get to sleep due to the soothing nature of the product and beautiful, gentle scent. We love that everything in it was natural, safe and not tested on animals. I'd highly recommend it to anyone with a baby or toddler.